When it comes to flooring in our house, all of us want to have decorative flooring which would not only look good, but also be easy to maintain and would be durable for a long time. Parquet flooring is one such type of flooring which has been popular since many ages to its distinct design & the many advantages it offers to its users. 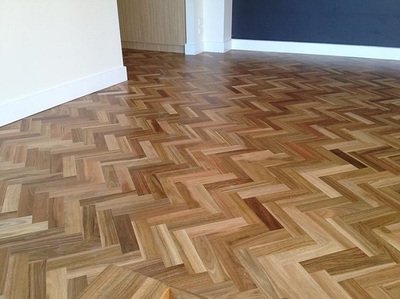 Parquet flooring essentially means any design made with wooden blocks to create a decorative pattern on the floor. This is generally seen in many condos, ships, decks, floating cottages and also in a large number of hotels, resorts and restaurants. In the olden days, Parquet flooring was made from solid blocks of wood which were laid in different patterns over bars and put in place by nails. Due to its inherent quality of not trapping moisture which in turn discourages rotting, Parquet flooring became hugely popular amongst the people who could afford it. Some of the most famous woods from which parquet flooring is done are the Oakwood trees, walnut, Pine, & maple trees as they are really solid and provide a good base for the flooring. Parquetry flooring is still popular today as along with being durable and long lasting, it can be easily customized as per the taste & the creativity of the owners. The beautiful geometric patterns made by parquetry & it’s hard to wear nature with ease of maintenance has added to its popularity over the years. However, while installing parquetry flooring, you should always buy the sealers and the final finish from the same manufacturer. Just like wooden flooring, Parquet flooring is very easy to clean and maintain since there is hardly any place where the dust will accumulate on. The flooring also resists any kind of staining which means you can easily wipe off any spilled liquid without worrying about it leaving a stain behind. Before you start installing the flooring, please ensure you clean the sub floor by removing all the paint, sealant, adhesive or any debris lying on the floor. The subfloor must be dry and the flooring tiles must be aligned properly to have the finest geometric patterns. One of the most important steps in installing a parquet floor is to ensure your sub floor is leveled properly. Any high areas or sunken spots need to be leveled by a sander or by filling in cement to level off the whole floor. Also you must ensure that there is no moisture retention or any sort of unwanted patches on the floor. A good drawing for reference purpose can help a lot in deciding the starting point of the design. Start applying the adhesive on the subfloor & immediately lay down the floor tiles on the wet adhesive. It is essential that the tiles do not shift while gluing them so ensure you are standing or kneeling on the subfloor. Keep sliding the blocks by approximately 1 inch up and down to ensure proper spread of the glue at the back. It is very necessary that the first floor tile be placed properly at its right place as that is the key element in the entire installation process. Once the whole floor has been laid down, the small gaps left between the tiles and wood blocks can be filled with trowel fillers. To ensure the glue sticks properly leave the flooring to dry for minimum 36 hours before you can start enjoying your all new creatively designed parquetry flooring. But you must also remember that the maintenance process of this flooring is also important. Ducted Heating - The Perfect Way To Keep Warm!